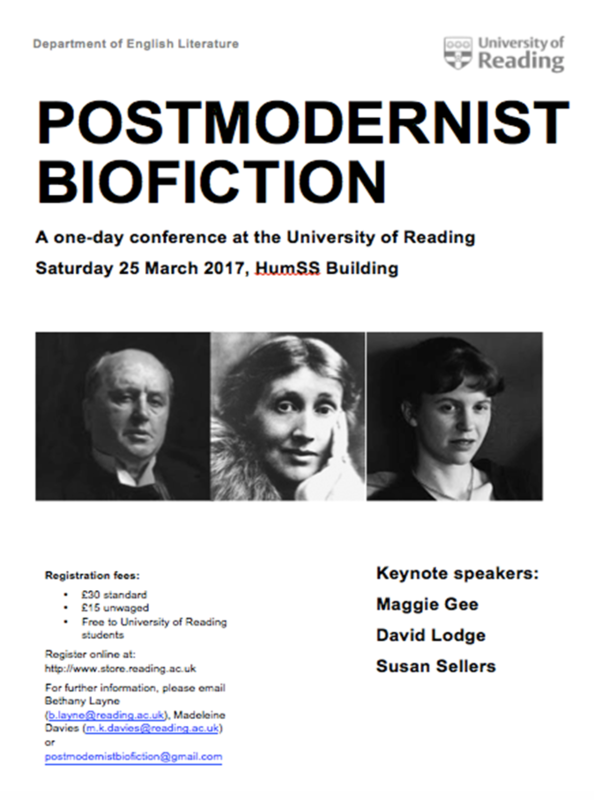 Postmodernist Biofiction: a one-day conference in the Department of English Literature at the University of Reading. Students and colleagues are warmly invited to attend this one-day conference where key speakers include authors David Lodge, Susan Sellers and Maggie Gee. Biofiction is a much-debated form blending the traditional genres of ‘biography’ and ‘fiction’ to produce a postmodernist splicing where questions of ‘fact’ and ‘truth’ are held up for scrutiny. In the modern era, biofictions have proliferated and texts such as David Lodge’s Author Author (focused upon Henry James), Susan Sellers’ Vanessa and Virginia (centralising the relationship between Virginia Woolf and her sister Vanessa Bell), Kate Moses’ Wintering (concerning the final months in the life of Sylvia Plath) and Maggie Gee’s Virginia Woolf in Manhatten (imagining a temporarily reborn Woolf exploring contemporary New York)have achieved heightened critical and academic attention. The Postmodernist Biofiction conference involves a selection of academic panels (including a student panel), keynote addresses and an interview with David Lodge; the discussions throughout the day will investigate a range of issues involved in this curious genre. Papers will be delivered on the postmodern construction of the subject, the representation of the female ‘artist’ in biofiction, US conspiracy theory presidential biofictions, and there will be debate about the ’ethics’ of a genre where ‘fiction’ connects with biographical ‘fact’ in novels about ‘real people’. We would like to involve our students in this event so please do join in if you have an interest in this fascinating topic. Colleagues from the University are also invited; come and hear David Lodge, Susan Sellers and Maggie Gee, as well as a range of academics and students, and contribute to the discussion about the intriguing textual hybrid known as biofiction. This entry was posted in Department of English Literature news and events and tagged Department of English, Department of English Literature, Dr Bethany Layne, Dr Madeleine Davies, English Department, English Literature, Postmodernist Biofiction, Reading, University of Reading. Bookmark the permalink.